According to news, Apple and Salesforce have come together to bring iOS features to Business apps. iOS is a mobile phone operating system manufactured by Apple, which works on devices like iPad, iPhone, iPod, etc. iOS is a lot different from other operating systems because of its security. The iOS puts each app in a secure protective shell, which is used to keep other apps from tampering with them. The recently released iOS version has many updates which focus on improving the overall performance of its devices. The updates include things like bug fixing, faster downloading, smooth scrolling, less crashes, AR inclusion, Siri, and many more. 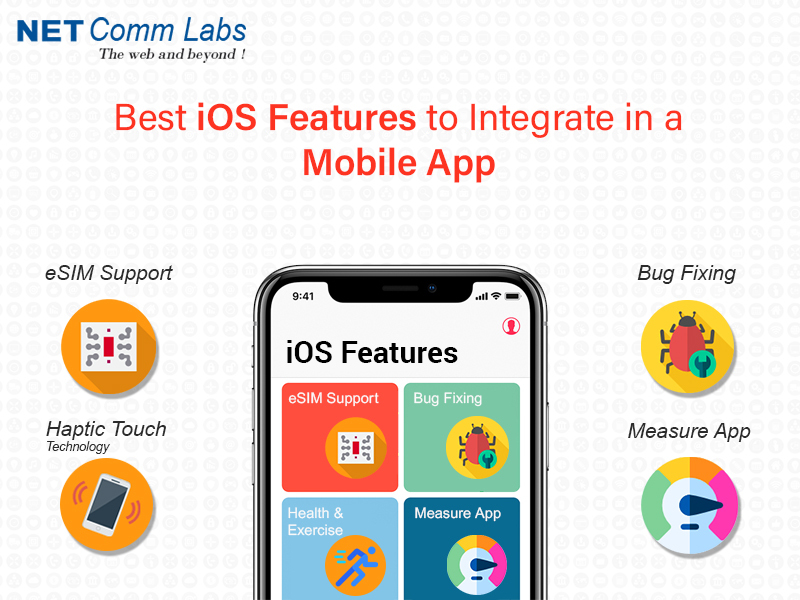 The current iOS version has many updated features that can be integrated into a mobile app, and to which iOS app development companies are looking forward to. Below are some features list that can be used while developing an app. eSIMs are getting extremely popular these days with the introduction of new phones and technology. Apple with its eSIM gives users the option to not use any physical SIM. This will help users to activate second cellular plans without the use of any second physical SIM. Not all the networks are supporting eSIM, in India Airtel and Jio have rolled out eSIM support. iPhone app development company in India is gearing up with the latest iOS update. The iOS 12.1.1 update has introduced Haptic touch on the iPhone XR. Unlike 3D Touch, Haptic touch is long press and vibration. Haptic touch can be used to view and expand notifications. The touch is based on how long a user touches the screen, app or the UI element. Based on the long press/touch, the content or contextual menu is displayed on the screen. For e.g. haptic touch can be accessed on torch, camera buttons, to view and expand notifications in the lock screen, for quick reply in notifications, it turns the keypad into track-pad, etc. This is the most important feature that has to be added to satisfy the users and their experience. Bug fix refer to the correction in the device to fix certain issues, it also includes to upgrade the device with latest available technology. The latest update has let iOS developers to improve the charging issue of the phone, solve wi-fi problem related to speed, voice problem, etc. This bug fixing feature can be integrated into iOS app development company while developing a mobile app. This is a demanding feature by the users in the market. iOS app development companies in Noida have created many apps related to health and fitness. These apps help in monitoring the workout routines. It helps to stay fit and healthy, check on our diets and habits and accordingly shares the data. People set their fitness goals on these apps and then fulfill it. The measure app in iOS uses augmented reality(AR) to quantify the real world objects. This means there is no need to get any measuring tape, just show off through an app. It is simple, just tap on the photo/object on your phone and let the do its magic by automatically detecting the measurements. It is a new concept for iOS app development companies and they are waiting to get their hands-on on such a technology.